Triptych: Ehmad and His Boat in the Central Marshes. Photo by Meridel Rubenstein, from Eden Turned on Its Side. This essay originally appeared in Eden Turned on Its Side, by photographer Meridel Rubenstein, Albuquerque: University of New Mexico Art Museum/University of New Mexico Press, 2018. Everyone knows which garden she meant. Something in us yearns to go back there. But could we, somehow? And to what, exactly, would we be returning? To anyone whose cultural roots are entwined with a certain mystical history emanating from the Middle East, the Garden of Eden evokes either a carefree time before sin appeared, or a pristine, untainted planet—or possibly both, if you believe that the twenty-first century’s eco-perils stem from our sins against nature. But whichever it may be, it hearkens to a time before any of us was alive—yet one for which we oddly feel a visceral nostalgia. That gut longing is even stranger, given that our notion of Eden comes not from experience, but from a book—in fact, from one of its most problematic passages. The Judeo-Christian Bible begins, logically enough, with God creating the world. Within six days, there are stars overhead, sun by day, moonlight by night, seas and sea creatures, land, plants, land animals, and finally people, both male and female. It’s a world we’d basically recognize, other than that it is entirely vegetarian: fruit, seeds, and green herbs shall be for meat, God tells humans and beasts alike. All of that is described in Chapter 1—where, incidentally, there’s no mention of any garden: the entire Earth is bountifully blessed. But in Chapter 2, after the seventh day when God rests, logic begins to unravel. Suddenly, the whole story starts over from scratch. This time, there’s no workweek plus a Sabbath; instead, God conjures up Heaven and Earth in a single day. And the sequence changes: again, he invents plants early on, but he sets them aside in some celestial nursery because, unlike before, he hasn’t created water yet. Next, he does so—then, just as the soil begins to moisten, he selects some dust to mold into a human being. A male. Only after breathing life up man’s nostrils does God add the foliage—but this time, it’s to a garden. However gorgeous and fertile it might be, Eden isn’t all bliss and leisure. Here, God intends for man to “dress,” “keep,” and “till the ground.” He sets guidelines about what can or can’t be harvested, designates a network of rivers for irrigation, and finally, lest man be lonely, creates animals. Adam gets to name these animals and to identify which are domestic and which are wildlife, yet they fail to assuage his solitude. So, borrowing one of his ribs, God clones him a more tempting companion. And you know the rest. Much has been made by Biblical scholars of these two conflicting, coexisting creation tales. As their syntax and even their names for God differ (Elohim in Chapter 1; Yahweh in Chapter 2), it’s widely assumed that they were written at different times by different authors, drawing on different versions of earlier Assyrian and Sumerian legends that were later conflated, often awkwardly, into a single testament by anointed redactors, who thrashed out what was canonical and what wasn’t. Babylonian Talmudists tried reconciling another notable discrepancy, over whether woman was born simultaneously with man or later ripped from his rib cage like a bloody afterthought, by declaring that both were true. Appropriating a Sumerian legend of a she-demon, they concluded that Chapter 1’s female was Adam’s rebellious first wife, Lilith, who disdained his authority and abandoned him. In Chapter 2, God tries to ensure that this doesn’t happen again. The woman fashioned from Adam’s own bone is merely his “help meet”—so subservient she doesn’t even get a proper name until after she also proves too disobedient and seductive to control and gets them booted from the garden. But in version two, we are no longer hunter-gatherers. We’re stewards of orchards, tillers of soil, and pastoralists of the cattle that Adam named. Thus was born agriculture. Yet by giving us a garden, was the Lord setting us up for a Fall? To grow, conveniently close at hand, food that we once roamed hither and yon to scrounge might have seemed to our ancestors an astonishing improvement over what Chapter 1’s God—or gods, or Mother Nature—had originally given us. But since a few farmers and herdsmen can feed many, the concentration of sustenance eventually led to concentrations of people. Soon our increasing numbers had to seek more fields and pastures, but they found that the greater world wasn’t all an oasis like Eden. Before long, as Genesis recounts repeatedly, people were warring over the choicest lands, and especially over water. This has not abated. What Genesis doesn’t mention, of course, is that we were fighting long before we were human: Our chimpanzee cousins have never traded foraging in trees for working the soil, but they battle for territory anyhow, as our common primate ancestors also surely did. What sets us apart from them, however, is what else agriculture ignited. Once farming and grazing were established, for the first time in our or any species’ history, a significant portion of the population didn’t have to spend all day finding food. Gradually people devised new things to do for a living: from artisanship to architecture to trade, from prostitution to priesthood. Soon many of us lived farther from crops and livestock and nearer to each other, in settlements, then villages, then cities. Whatever grief early urban dwellers might have sustained for some fabled, lost Edenic profusion gave way to the thrill of something entirely new: civilization. 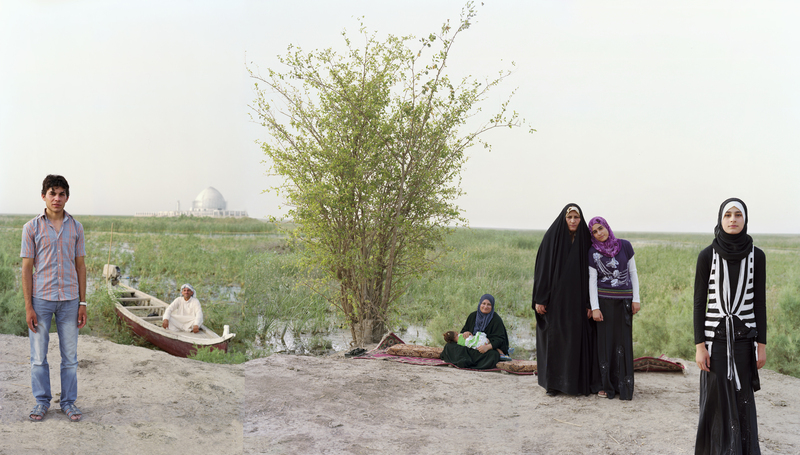 A New Adam and Eve in the South Iraqi Marshes. Photo by Meridel Rubinstein from Eden Turned on Its Side. Long before that happened, successive waves of Homo sapiens had begun dispersing from our African origins. By fifty thousand years ago, we had spread all the way to Australia—and, by about fourteen thousand years ago, to the Americas. As a result, civilization emerged independently in several places. Among the first to appear was likely the one in the fertile crescent that our prehistoric ancestors followed from Africa into Asia. As we continue to learn about it, it turns out that Eden may be more than just a metaphor. Genesis locates the Garden of Eden quite precisely, near the confluence of four rivers: the Tigris and Euphrates—whose joint Mesopotamian valley is often called civilization’s cradle—and the Gihon and Pison. The 1611 English-language King James Bible placed the Gihon across the Red Sea in Ethiopia, rather far from Mesopotamia. But several modern scholars believe that its translators confused Ethiopia’s ancient name, Cush, with a similar Hebrew name for the land of the Kashshites, who lived in what is now Iran’s Zagros Mountains. From there a substantial river, the Karun, flows southward, reaching a delta just above the Persian Gulf at a point almost directly opposite Saudi Arabia and Kuwait’s north-flowing Wadi Al-Batin. That point is sixty miles below where the Tigris and Euphrates meet today, but back then—as noted by archaeologists who contend that the Karun and Wadi Al-Batin are the Bible’s Gihon and Pison—local topography was far different. Until about eleven thousand years ago, repeated Pleistocene glaciations locked much of the world’s water into ice sheets, and oceans were hundreds of feet lower than today. When the first Homo sapiens reached the Persian Gulf, its upper third was well above sea level. British archaeologist Jeffrey Rose calls it the Gulf Oasis: a luxuriant delta, continuously fed by nutrient-rich sediments borne by the Tigris, Euphrates, Karun, and Wadi Al-Batin. For hunter-gatherers, it would have been a paradise. But post-Pleistocene warming, which allowed their descendants to learn how to farm local wild wheat and legumes, also meant that to the north, vast glaciers were melting. As the thawing accelerated, worldwide coastal flooding commenced. At its peak, eight thousand years ago, Persian Gulf waters were encroaching so fast, according to American archaeologist and Middle East specialist Juris Zarins, that with each generation they advanced several kilometers farther inland. By the time civilization awakened in its cradle a millennium later, paradise had been lost beneath rising seas. Fall and flood: memories passed from prehistoric ancestors to Mesopotamia’s Sumerians, Assyrians, Akkadians, and Babylonians, who passed them on to the Hebrews, and to us. Today, the last traces we have of the oasis that inspired them are some lush wetlands in Iraq’s Tigris-Euphrates floodplain, upstream of that now-submerged Eden. 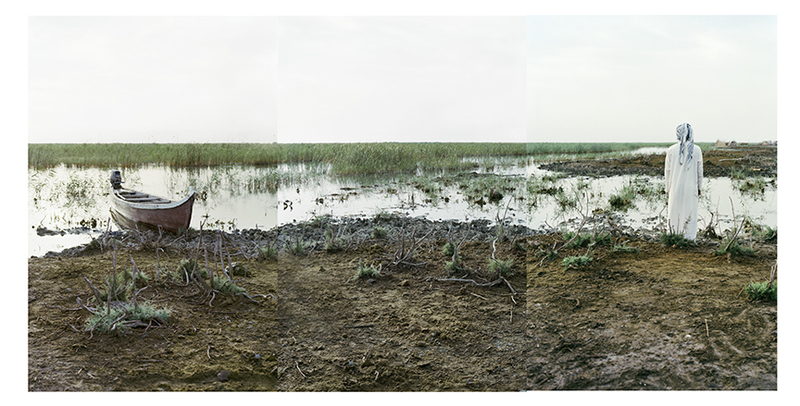 During the 1990s these rare marshes were also nearly lost, when Iraqi dictator Saddam Hussein tried to drain them to expel Shia rebels. But following his ousting, a courageous local and international effort has recovered almost half of them. Staunching that ecological disaster is one of the few encouraging stories from that tortured region in recent years—but unless we act decisively, it could prove in vain, as ice is melting again. In an elaborate, circuitous lineage that humanity has confected, agriculture begat civilization, which begat industrialization, which inevitably—some might say incestuously—begat industrialized agriculture. Force-feeding soil with chemical fertilizer, and genetically developing hybrid grains with many extra kernels per stalk, we multiplied our foodstuffs far beyond what nature ever could supply. But unintentionally this unprecedented abundance also multiplied ourselves. Averting famine means more people live to beget more people. And so human numbers quadrupled during the past century—the most abnormal population leap for any large species in the history of biology. With all of us hooked on energy, the exhaust from our swollen industrial civilization keeps turning up the heat, forcing seawater up river deltas and over coastlines. If the result of Adam and Eve’s original sin was procreation, here we are again, headed for another fall. Pushed to this modern brink, more than ever we long to reclaim the fresh hope of Eden. Yet lest we despair, it’s comforting to realize that one day this Earth will surely see Eden restored. Should our yearning help us muster the environmental wisdom and the will to act upon it, we’ll do whatever it takes to bring humans back into balance with the rest of nature. Or, should we fail, we’ll drag many more species and much priceless Earthly beauty down with us. But not forever. This planet has endured enormous losses and massive extinctions before, from cataclysmic volcanic eruptions to colliding asteroids—yet each time, life, miraculously resilient, has rebounded, lovelier than ever. As it will again. One way or another, we’ll be there too. Either we’ll have survived our excesses, and, like Noah, saved enough animals to give our own species another chance—or, like Adam, we will have returned to the dust from which we sprang.